Clearly both Putin and Xi have every interest in seeing Trump and Kim Jong-un reach an agreement. But at the same time, they are well aware of the situation in the Middle East and Iran that risks plunging the whole region into unprecedented chaos. Putin and Xi are clearly trying to manage the chaos emerging from Washington, as are Assad and Kim in their own own way. In this sense, the repeated aid of Russia and Iran to Qatar is part of a Sino-Russo-Iranian strategy to contain the chaos created by Washington, which has even extended to the Gulf states with the Saudi-led blockade of Qatar. In this regard, even Berlin is beginning to be enticed by the opportunities for the European Union beckoning from the east, this temptation made stronger by the reality that the Atlanticist relationship is hurting Europe through the tariffs and penalties imposed on American geopolitical opponents like Iran. European companies have suffered major economic losses as a result of Trump’s suspension of the Joint Comprehensive Plan of Action (JCPOA), with European companies facing US sanctions should they continue to do business with Iran. This is only the latest example of undue pressure being placed on the energy strategy of sovereign countries that are theoretically allied to the US. In the same way, the sanctions placed on the Nord Stream 2 project are further widening the cracks in the Atlantic alliance. To understand the level of disorder within Europe, the North Atlantic and the Middle East, it is enough to consider the attack on Mohammed bin Salman almost two months ago, with Israel on the one hand boasting about agreements with Iran for a mutual abstention in the Daraa affaire and Trump finding nothing better to do than to break every alliance in sight through his commencement of a trade war. It is clear that the old unipolar order no longer exists and that we now find ourselves in a multipolar situation, courtesy of the isolationist direction of the United States. This enables the further smoothening of existing divergence between nations in Asia, the Middle East and part of Europe. The neoliberal ideology, broadly acquiesced to by the “left”, has remained anchored to the diktat of the “old” unipolar world order, which saw Washington as the only hegemonic force. The take-home message that Trump seems to be giving Europeans is that it is pointless for them to remain as butlers who wait on Washington. We are living in a defining moment that will shape the the near-term future of vast areas of the world. There are many situations that are moving forward, bringing us closer to the moment where the West will either find common ground or splinter. Factors hitherto appearing unrelated are now serving to have different countries coalesce into a common destiny. The summit between Trump and Kim Jong-un will lay the groundwork that will reveal whether Washington really wants to start talking or is only buying for time. Given the recent behavior and attitude of Trump and the political figures around him, the summit, like the foreign policy of Trump’s administration in general, becomes unpredictable and difficult to decipher. 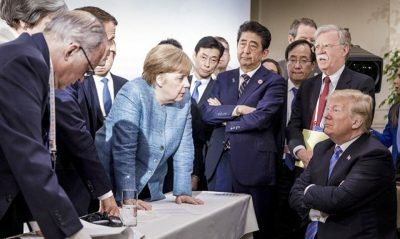 If there is one thing that unites the leaders of the G7, the SCO and Kim Jong-un, it is precisely the difficulty of relating to a declining world power and a leader who has no strategic vision; the common suffering stemming from an internal struggle within the United States to impose upon the world its antiquated and declining strategic vision.